SOFA AND CHAIRS:Amazing handmade suite of furniture, beautifully- crafted with wooden frames, and then upholstered by some talented maker, probably during the last mid-century. 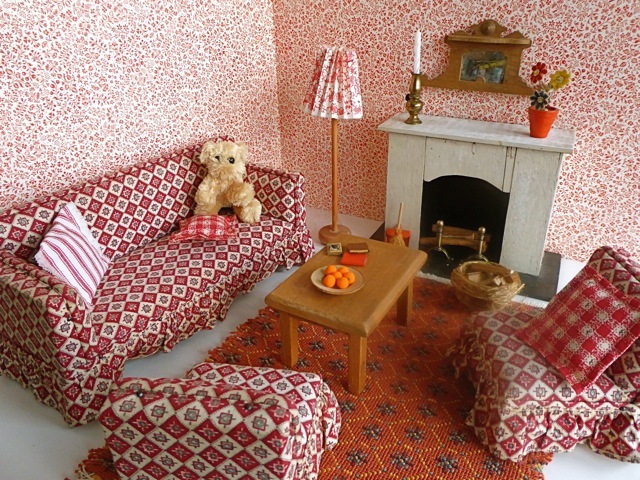 The sofa is a very generous length, so this little room will seat a large family of dolls! The set features a geometric print on the sofa and two side chairs, and very fine piping details. In addition, there are three handmade scatter cushions. Dimensions: sofa length 10.5in/27cm x depth 4.5in/12cm x ht 5.5in/14cm. COFFEE TABLE: A handmade, oak coffee table. On the table sit a turned wooden bowl of faux tangerines and three little books. LAMP: A handmade, wooden, standard lamp with a handmade, pleated paper lampshade. 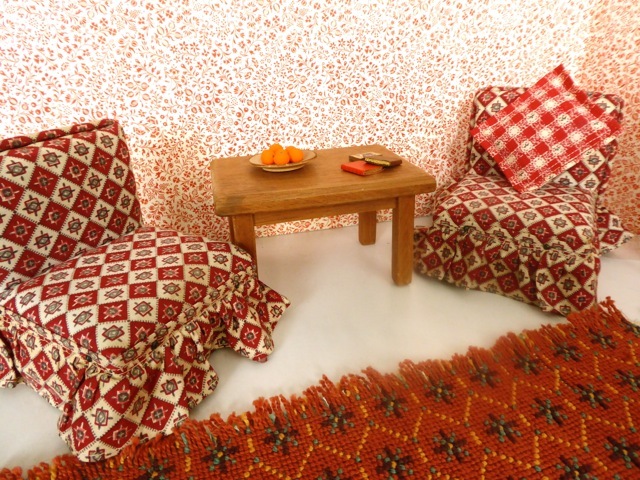 RUG: A beautiful vintage piece of tapestry-weave fabric, becomes the perfect rug. 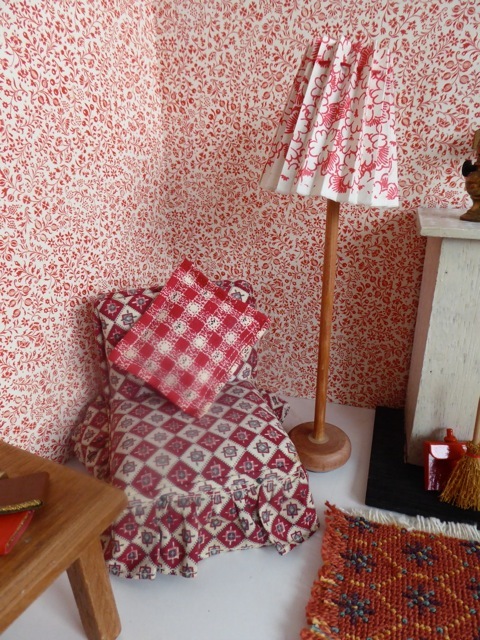 WALLS: Covered in a retro print, Italian wrapping paper. It has been mounted on two A3 pieces of 5mm thick foam board. Each piece of foam board measures 42 x 29.5cm or 11 5/8 x 16 3/8in. 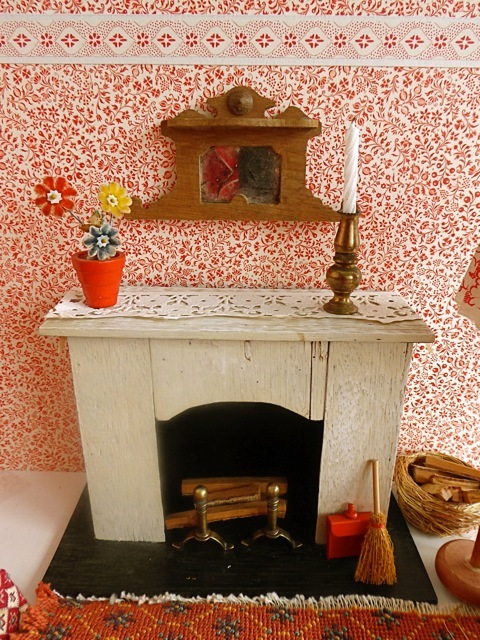 Note the cornice detail of a contrasting wallpaper border. DOLL: Chosen from our selection of vintage dolls. 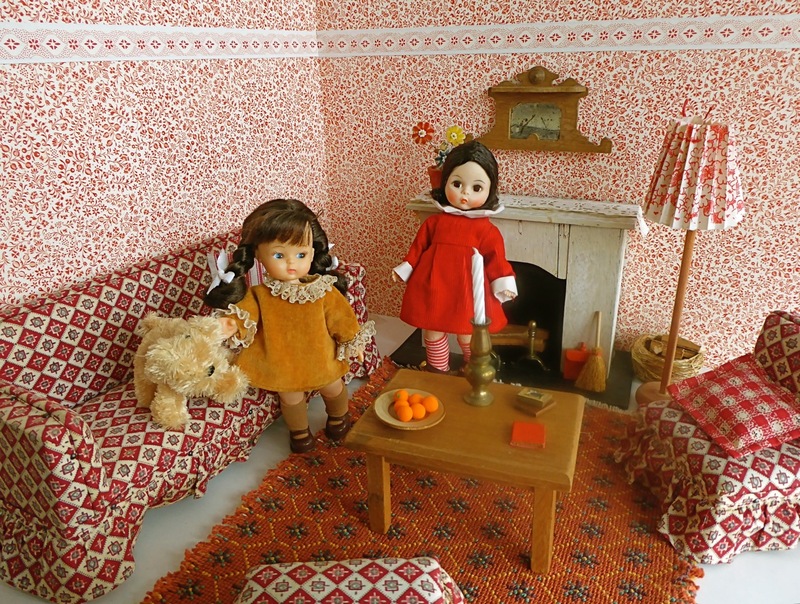 Shown here, a 1950s Madame Alexander doll, and a more modern doll with painted –on eyes, both available upon request, as are their beautiful velvet dresses. Note that there are lots of other clothes available for both dolls – please see the latest items at our newest online shop – go to Etsy, www.Etsy.com - search GoodGollyMissDollyUK.